So, brekkie was had, coffee and tea was drunk at the excellent facilities that HRH/Haven had to offer. Album browsing at the metal market(vinyl was bought) and a bit more Doom was taken in – I’ve come to the decision that I don’t particularly like Doom! I missed the first couple of songs by opening act Euphoria Audio. I was looking forward to this UK outfit. They come across as the type of music that makes your toes curl – similar to Daughtry, David Cook, Jonas Bros etc etc – but I personally like this stuff. There’s shitloads of bands like this across the US that make a good living, but not so many UK bands. It’s the type of music that middle age women of a certain age lap up in droves. And some middle age men! But a friend nailed it when she said that she wants to hear music that makes her stop a conversation, turn around and watch the band. This was no such case. Euphoria Audio have some decent enough songs, and a very good singer in Matt Shirty (but there was very little stage presence – which showed when guitarist Ben Lloyd had an issue and Shirty didn’t really know what to do with the dead time). That said EA were enjoyable enough, went down reasonably well considering the attendance was piss poor vs the same time the previous day. But, if I could describe the experience in one word it would be ‘beige’. Reach on the other hand literally exploded into life. They looked the part in the true spirit of AOR/Hair Metal – a mass of hair, shapes being thrown, it was like they have been watching hair bands of the 80s for their homework and getting A grades (they all looked about 14!). They certainly are young guns in the making and have much great chance of making it that in their ‘other’ job with Adrenaline Rush. Their playing and confidence belied their very young years, and what with an opening song like ‘You Called My Name’ they are on a high trajectory to fame and hopefully some fortune as well. I have to admit that live they are a different proposition to the recently released album, much better in the flesh and growing with every passing gig. ‘Make Me Believe’, ‘Fortune and Fame’, and ‘Coming Home’ are the better songs. For some reason the closing song, ‘Black Lady’ is one of their finest, yet never made the album. Watch out for these lads they are going far. that a band, not exactly rolling in it, is prepared to travel half way around the World to perform. A few of the new songs were chosen, and rightly so as ‘Caught In The Crossfire’, ‘Below The Belt’, and ‘Just Another Night’ are some of the gems from ‘Crossfire’. I’m guessing that Jules is a big Aviator fan as they finished their set with the classic ‘Frontline’ and bloody good it was too. It was probably the best he sounded all gig. Cracking stuff. Eclipse are a very anthemic band, on this occasion the songs picked – ‘Wake Me Up’, ‘Bleed & Scream’, ‘Aint Dead Yet’, ‘Battlegrounds’, ‘Blood Enemies’, ‘Stand On Your Feet’, etc etc, - it was like being twatted with a hammer for 50 minutes as Eclipse were RELENTLESS. It was a bombastic approach which ensured maximum attack. My highlight was the guitar-off between Martensson and Hermansson before the Jelly Roll-esque ‘Breakdown’, which is one of my fave live tracks from ‘Armageddonize’. If you were lucky to catch them on their UK tour either side of this event, all I can say is was that they were even better than this performance, and that’s saying something. Erik Martensson is the baby-faced assassin of melodic metal. I caught Crazy Lixx at last year’s inaugural Frontiers Festival in Milan where they appeared first on the bill of day 3. Then they were OK to reasonable, now just over 10 months later they have improved immensely which was proven by the attendance in the arena for them. Again, Crazy Lixx were here to play mostly from their recent album. They are more Sleaze than AOR, but that didn’t stop them in releasing both barrels. Singer Danny Rexon announced that it was his first time out with a guitar. I think the change from last years line up to now has made things better and seemed tighter. More Motley Crue than Magnum, the lads held the audience in the palm of their hands for the likes of the excellent ‘Hell Raising Woman’, ‘Heroes Are Forever’ and ‘Outlaw’. Based on this, I expect great things over the course of the next couple of years. I wasn’t too sure what to expect from Houston. Certainly the audience didn’t either as a good 30% had vacated for them. Well all I have to say is, more fool them, as they missed a very stellar and polished performance. They weren’t without their issues as Calle Hammar’s guitar broke a string, and didn’t come equipped with a second guitar. The rambling’s from singer Hank Erix were completely devoid of any interaction, but he more than made up for it in the quality of his voice and for me was one of the best voices of the weekend. Houston are one of the bands whose songs are in the true spirit of AOR, what with the keyboard laden opener ‘Glory’, to the newer songs such as ‘Don’t Look Back’, and ‘Standing On The Moon’. If not too careful, they could be seen as a overblown cover band, and I like their own stuff better than the covers. That said, the covers are true to the originals and are bloody great versions of already excellent songs, specially ‘Runaway’ by Dakota. For closing song, ‘Return My Heart’, both Hammar and Ma’Aoui jumped in the pit to interact with the crowd and nearly gave the sedate North Walian security a slight arse twitch moment. It was an excellent performance from yet another high flying Swedish band. soon to be released ‘Spin’. It wasn’t a total abandonment as ‘Inside Out’, ‘Cry Myself To Sleep’, ‘Wild Child’, and ‘Attracted To The Animal’ were represented. One thing that RD have in their armoury is the very underrated Craig Joiner. All eyes are directed at Leigh Matty for good reason, but Craig is the superglue of the band. Not only that, the brand new songs, were pretty damn good. ‘Radio’ in particular, is a massive slice of radio friendly rock that is screaming to be played on Radio 2 when its released in April. 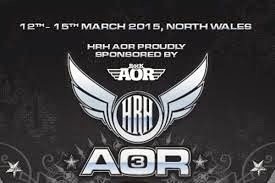 The ladies were poorly represented at HRH AOR, but Leigh Matty more than made up with a classy performance. The upcoming tour with FM in May will be one tour that’s hard to resist. So, onto FM. They had been forced to cancel an earlier acoustic performance at HRH AOR, but you would not have a Scooby Doo as to why when watching this full on electric set. When FM is given 60-70mins to perform, this is where the magic really happens as it’s a bombardment of classics with a capital ‘C’. Some of the fillers of a normal set are replaced with heavy hitters from the last 30 years. With Jim Kirkpatrick on board, FM has become a heavier and rockier composition – that shows with this setlist. Only the power ballad ‘Closer To Heaven’ represents FMs softer and lighter side tonight. The ‘guns blazing’ approach works for the 21st Century version of FM. Since their reformation in 2007, FM are on a sweet a roll as anyone else that’s out there; their output is consistently high; and when you have a singer in the mould of Steve Overland, its hard not to bask in their supreme quality. The new song ‘Diggin’ Up The Dirt’ is a belter, and, couple this with the heavier tunes such as ‘Tough Love’, ‘Wildside’, and ‘Crosstown Train’, and its one pearler after the other. The biggest shout of the night is for their biggest song ‘That Girl’, and 30 years later its still one of the best songs of FMs or any bugger else’s career. Catch them in all their glory in April and May. Night Ranger haven’t exactly been perennial visitors to these shores. It’s only the last couple of years that an effort has been made. Jack Blades commented that they have a five-year plan for the UK. Next year it will be 2 x gigs, year 3, 3 gigs, and so on - that is if Brad Gillis is still alive in five years time! Night Ranger show why they are headlining a festival – 35 years after they started. They are consummate professionals, and have probably played every weekend for the last 10 years. Night Ranger are as polished as Mr Sheens/Windex (for US readers) testing laboratory. New to the line up is Alice Coppers gunslinger Keri Kelli, and you know what, it feels like he’s been with them for 20 years. Jack Blades is the main focal point, but when Kelly Keagy comes to the fore it gives them even more presence – especially as Keagy’s voice hasn’t diminished. Highlights for him in particular are ‘Sentimental Street’, ‘Sister Christian’, and the bloody fantastic ‘Don’t Live Here Anymore’. Blades moves around the stage with the energy on man half his age, and what with his stage patter is an absolute joy to watch. I’m a fan of Night Ranger and Damn Yankees, but I wouldn’t give a toss if Alice Cooper’s ‘Schools Out’, Ozzys ‘Crazy Train’ or DYs ‘Comin Of Age’ or ‘High Enough’ were represented. I’m sure Keagy would love to plug a solo song or two! That small grip aside, NR are a fantastic proposition live – ‘Lay It On Me’, ‘Secret Of My Success’, ‘Eddies…’ and the ultimate closer, ‘(You Can Still) Rock In America’. Let’s just hope they stick to Blades 5 year plan, and play somewhere other than London for a change in the future. I bow to HRH United team as AOR is a genre that’s never been the most popular. They have a great home in Haven at Pwllheli, with fantastic facilities, and hopefully another 10 years in the festival at least. Its up to the new wave to drive it forward otherwise 90% of the bands will have retired by then. Here’s to next year.